Also Called: Celery-leaf buttercup, cursed crow's-foot, blister buttercup. 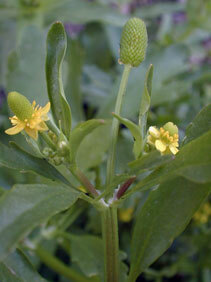 Stems: Erect, 1-several, stout, branched above, hollow, glabrous; up to 40 inches long when submerged. Leaves: Alternate, mostly palmately 3-5-lobed, light-green, glabrous; basal and lower stem leaves with stalks 1 to 6 inches long, kidney-shaped, .4 to 2.8 inches long, 1.2 to 3.6 inches wide, deeply 3-parted; segments linear-oblong, again cleft or lobed; terminal segment more shallowly 3-lobed; lateral segments 2-3-lobed; lobes blunt to rounded or with teeth; upper leaves much smaller, short-stalked to sessile; palmately-divided; divisions oblong or linear, margins entire or few-toothed; uppermost bracts simple or divided into oblanceolate or linear segments. Inflorescences: Solitary flowers, terminal or on ascending stalks in upper leaf axils. Flowers: Small; sepals 5, egg-shaped, about 1/10 inch long, spreading to bent back, yellowish-green, usually glabrous; petals 5, egg-shaped, 1/10 to 1/5 inch long, pale yellow, fading whitish; stamens 10-25. Fruits: Achenes, numerous, together in short cylindrical head-like groups, 1/6 to 1/2 inch long, 1/7 to 1/4 inch thick; achene body tiny, flat, egg-shaped, glabrous. Habitat: Wet areas, margins of ponds, lakes or streams, marshes, ditches. Toxicity: Poisonous to livestock. The sap is reported to cause blistering when it comes in contact with skin. Uses: Native Americans would rub the plant on their arrow points as a poison. Comments: The common name "cursed" alludes to the plant's habit of growing in "vile places". Derived from the Latin root rana "frog and unculus "little", probably in reference to it being found in wet areas. Latin sceleratus or "polluted by crime" may refer to the irritating sap.